The Vista Series of built-in electric fireplaces have been designed to give you maximum in flexibility in selecting a unit that perfectly suits your needs. 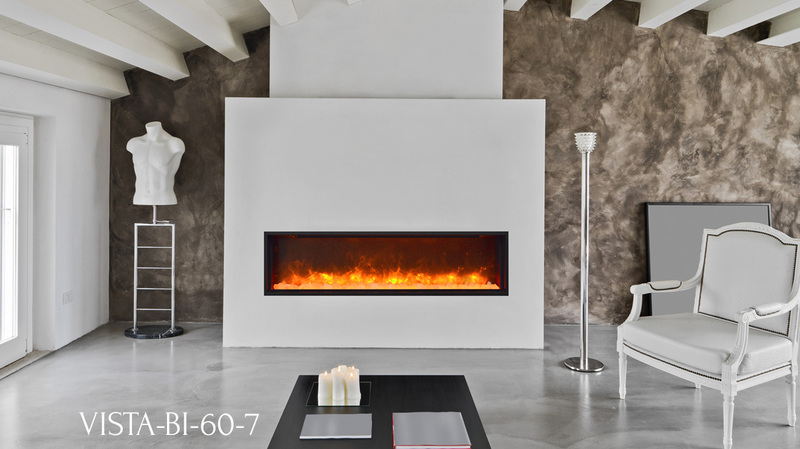 This stunning line of built-in electric fireplaces offers 50”- 72” length units. These units are also available in Deep (12”) or Slim (7”) depths and in indoor or outdoor rated models. You choose what works best for your residential or commercial application. Models are designed to be built-in and allow for the finishing material to be built right up to the glass edge or, the included surround can be used as an alternate finish option. The 12” models come with ambient canopy lighting in 13 colors, Himalayan salt crystals, sable fire glass and an impressive 11 piece log set. The 7” models come with Himalayan salt crystals, sable fire glass and a 1 piece log set. No ambient canopy lighting on 7” models. The fireplaces in the Vista Series come with: Full Frame Viewing Area and A Kaleidoscope of colour. Note: All Vista units that are installed outdoors or in moisture intense conditions must use the stainless steel cover. Proof of purchase of the cover is required for any warranty claims.